Kung Hei Fat Choi! Happy New Year of the Water Dragon! Gōng Xǐ Fā Cái. Gōng hè xīn xǐ! Happy merrymaking to everyone! It’s a blessing to meet another New Year, and as a way to help us remember our gifts and dreams for the year, I’ve added ten auspicious, good luck blessings that people shower on each other during the Chinese New Year celebrations. Enjoy the ten blessings, the two videos, and ten important facts about this special event. Below are 10 popular and auspicious blessings/sayings for the Chinese New Year. They consist of four Chinese characters and special blessings. ♥ The Chinese New Year is the longest and most important of all the traditional Chinese holidays. It is also known as the “Spring Festival,” marking the official end of the winter season. ♥ This year, we celebrate the Year of the Water Dragon: from January 23, 2012 – February 09, 2013. It is considered a symbol of good fortune and a sign of intense personal power. ♥The tradition of the Chinese New Year is to encourage people to reconcile, forget all grudges and sincerely wish peace and happiness to everyone. ♥The biggest event on Chinese New Year’s Eve is the Reunion Dinner. People eat special foods that represent good luck; pigs, ducks, chicken, sweets and fish. Also Niangao, a Chinese New Year cake. In the morning, children greet their parents by wishing them a healthy and happy new year, and receive money in red paper envelopes. The night ends with firecrackers. ♥The New Year consists of 15 Days of Celebration and recognition of the festivities; from welcoming the gods on Day 1 to celebrating the Lantern Festival on Day 15. ♥ The Chinese New Year is celebrated in many countries and in Chinatowns with large Chinese communities; countries include Mainland China, Hong Kong, Macau, Taiwan, Singapore, Thailand, Indonesia, Malaysia, Philippines, and Vietnam. ♥People collect money to buy each other presents, and families clean out their homes as a way to cleanse their space, to welcome the new, and to sweep away any ill-fortune. Happy Chinese New Year: Ten Blessings & Ten Things To Know… Dragon banner..
NYTimes Video On Chinese New Year Fireworks – Watch it! 年年有馀 niánniányǒuyú – Wishing you prosperity every year. ♥A major part of the New Year celebrations include Fireworks. Firecrackers are lit everywhere to help drive away Evil spirits. The belief is that these malevolent spirits can’t handle loud noise, so the Chinese New Year is also a time of very loud celebration. Positive Motivation Tip: May your Chinese New Year be abundantly blessed! Did you go very distant! the perfect world is a dream ..
but the music is beautiful. Good, as you know, just be you! on Japan? you have some news? A very good day, kiss. thank you for the Ukulele video of the US-billionaire – he stayed modest it seems! Love the dragons. We really should take the kids in to see the parade on Sunday – you’ve just reminded me! Happy Chinese New Year, Elizabeth! Buffet on a ukelele? Totally unexpected. Feel like I missed the point of the second video though. That’s an interesting story of the origin of the Chinese New Year. We had fireworks here the other night. I hear there was an even bigger celebration in Kingston. Very interesting. Thank you for the enlightenment about Chinese New Year. When I lived in Salt Lake City, Utah, I attended several Chinese New Year dinners with my roommate, who was a Chinese educator who fled mainland China during the Communist takeover. They were always interesting. No firecrackers but lots of red and, I believe, gold. Great post! The Buffet video is a hoot. Blessings to you this year of the dragon! Kung Hei Fat Choi to you and may all your wishes come true! I never knew all these things about the Chinese New Year until reading your post….thanks for the information! It is so interesting! Thank you for the wonderful background on this fun New Year…. Happy Chinese New Year Elizabeth! I’ve been to several Chinese New Year celebrations over the years and never knew the significance of the color red! Thanks for that. I’m the Water Dragon. Hope to live up to that description! Maybe I’d better get a red bandanna to scare off that Nian. Great information here! Happy Chinese New Year! Another thing that I really like about Chinese New Year …. the candied treats! My two favourites are the candied wintermelon and the candied lotus root. Yummy….! I am reading your post instead of watching the State of the Union address. I feel so calm. Happy Chinese New Year to you, too! My daughter is an Earth Dragon and my granddaughter (intelligently) just missed being a Water Dragon. I’m so glad! This is a very informative article. Thank you for posting it. WoW Debra! You are deep in that water path… Yes dig in and learn more, it will uplift you. TY! What a bright and happy post. Thanks, E! So wonderful and wondrous–the Year of the Dragon. 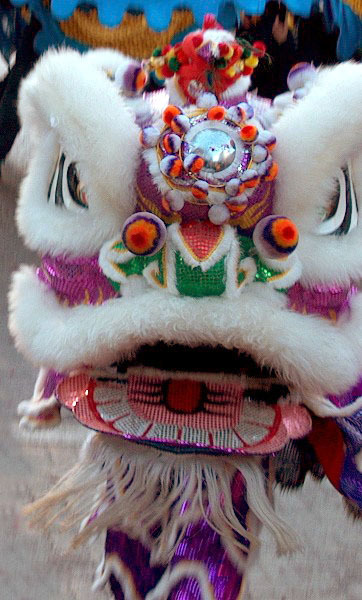 Love the photos of the Dragon Dance, the traditional Lion Dance, and the Water Dragon. And already thought Warren Buffett was a really good guy–now I KNOW it! “May you reach your ambitions” is the wish I send out to everyone today. Great post…I learned something new today! oh, hey, that is cool writing!! I thought about going to San Francisco to experience Chinese New Year in a different way, but wound up going to La Costa instead. Maybe next year! THanks for hitting the like button on my City Shapes today. I enjoyed this post. very nice religious blog…….I know I am so late to say that but happy Chinese new year. Thank you for stopping by. Jíqìngyǒuyú – May your happiness be without limit! Gong Xi Fa Cai — Wishing you a very auspicious Lunar New Year! I love how people celebrate traditions. We are a fascinating species.